BJP won as Muslim vote split among many rivals, it repeats candidate as others field Muslims again. The population of the constituency includes an estimated 23% Muslims and 17% Dalits while the BJP will be looking at a consolidation of the 58% Hindu vote. In Agra South, a sensitive constituency that was rocked by the murder of VHP leader Arun Mahor in 2015, the poll fray reflects that of 2012. 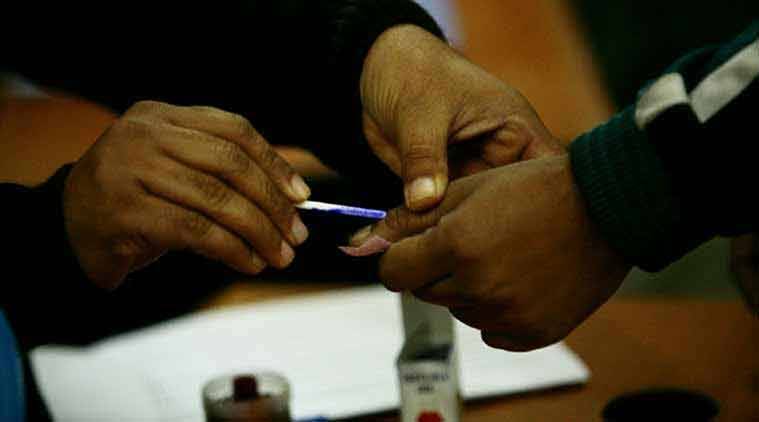 The SP-Congress and the BSP have again fielded Muslim candidates, the AIMIM has joined the fray, while the BJP has renominated its sitting MLA Yogendra Upadhyay, a Brahmin, who had gained from a divide in the Muslim vote last time. In 2012, Upadhyaya won over 74,000 votes while the next four candidates, Zulfiqar Ahmed Bhutto (BSP, 51,000), Nazir Ahmed (Congress, 40,000), Mohammad Sharif Usmani (SP, 13,000) votes and Chaudhary Bashir (RSMD, 9,000) together polled 1.13 lakh, with the first two individually exceeding the winning margin of 23,000. This year, the BSP has again fielded Bhutto while the Congress’s Ahmed has SP support too. Other Muslim candidates in the fray include Mohd Idris (AIMIM) and independents Ashraf Qureshi and Mustakeem. Raza Mohammad, a carpenter in Mantola, says he will vote for the SP as he feels the Akhilesh Yadav government has performed. Anees Mohammad, who repairs TV sets in Nai Ki Mandi, would rather go with the BSP because he feels the family feud has ruined the SP’s base. Mahor, VHP vice president for Agra city and a campaigner against cow slaughter, was gunned down in 2015 by unidentified men while on his way to a temple after opening his furniture shop in Mantola. The situation was tense for days thereafter as hundreds of activists of various groups camped in the city. Among rival parties, the BSP is awake to the prospect of the Muslim vote getting divided once again. At every rally, BSP chief Mayawati has warned Muslims not to “waste” their votes on the SP. Bhutto, the BSP candidate, hopes Muslim voters have “learnt a lesson” from last time. “I have a done a lot of work here, even though I have not been the MLA. Muslims have learnt a lesson, they know that the BJP will never be with them while Raj Babbar of the Congress will never let any minority candidate win from here or anywhere,” he says. BJP MLA Upadhyay says he will not let anyone cross 1,000 votes this time. He accuses Bhutto of “protecting” Mahor’s killers. He stresses that the BJP is seeking votes on the basis of work done. 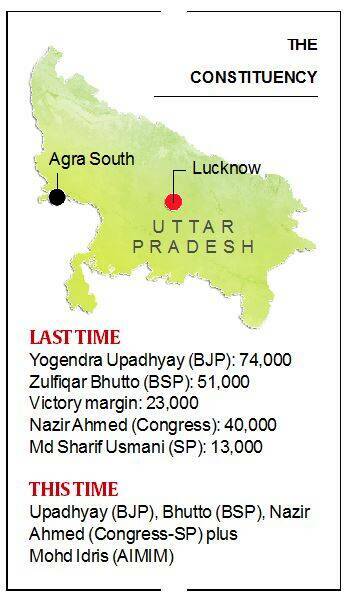 In 2012, the BSP had won six of the nine seats in Agra and finished second in the other three, including Agra South.